Paris courts face a hectic period after more than 400 people were arrested on Saturday, as the second Gilets Jaunes protest in seven days in the capital descended into violence. Police prefect Michel Delpuech described "violence of unprecedented gravity" on and around the Champs-Elysées. "[A total] 412 people have been arrested, something not seen in decades in Paris," he said. Hammers and petanque balls were among the objects used as weapons against police officers. Firefighters were called out to 249 fires on Saturday alone, many of which had been deliberately started. By Sunday evening, some 378 people remained in custody, including 33 minors. The first court hearings have been scheduled for Monday and Tuesday, prosecutors said. "Never has the Paris Public Prosecutor's Office had to manage so many police custody cases," said Paris Public Prosecutor Rémy Heitz. "A policy of firmness will be applied." 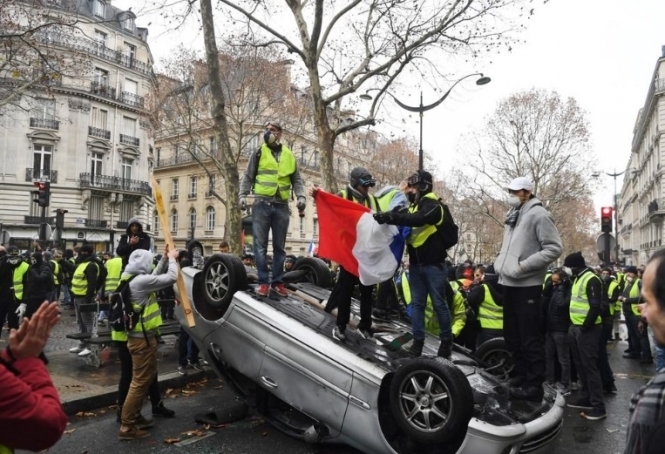 But a police union has warned that its members "can't take it anymore" and called on President Emmanuel Macron to "assume his responsibilities", after the protests on the Champs-Elysées turned violent for a second week in a row. Yves Lefèvre, a member of Unité SGP Police FO, told France Inter: "Police are not going to remain the last line of defense against the insurgency. "I am calling on the President of the Republic to take responsibility, because the cops are not going to serve as a last bastion. That is out of the question." He was speaking after an assault rifle was stolen from a police vehicle during the violent scenes in Paris on Saturday, December 1. He said: "They did not take it to make garlands, it is clear. We have criminals in front of us who want to kill cops." He added that the trouble got worse as the day progressed. "Now, we have entered a phase of ultra-radicalisation, we are now on the brink of insurrection."